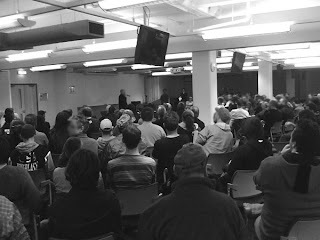 As far as I know there is only one report covering the London Anarchist Conference of June 6th. It sounds even more depressing than the photo - especially the comments. Some years ago a trotskyite wrote a dissertation about the role of anarchists during the occupation of the Netherlands by the Germans (you are supposed to call them "nazis" now, that sounds more polite and pro-European - Britons may ask about this on the Channel Islands). The conclusion of this trotskyite was: there was no anarchist resistance. No, there was not. There were some individual anarchists reasoning along the lines "government is government, no matter who does it". And the others worked together with whomever they could work with. It simply just is not anarchist to claim action of any kind, even under less severe circumstances. You just do what you think is right. (Of course, this applies even more to those who identify with Christian anarchism). It took us two issues of the anarchist journal of which I am one of the editors to explain this. It gave me the opportunity to make the sad discovery that Felix Ortt, namesake and son of the most influential Dutch Christian anarchist, was auf der Flucht erschossen in a concentration camp in Poland, where he had been detained as a member of the resistance. In which his ageing father played a modest role - according to his age - too. Never boasting, never even showing sadness. Sadness I can feel about the comments on the Indymedia-article mentioned above. When will they ever learn, indeed? 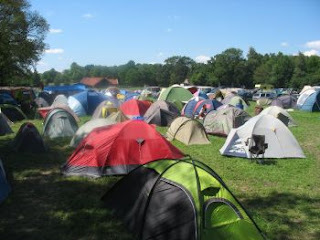 To brighten up this posting: tents of participants of the yearly anarchist gathering at Whitsun/-monday in the Netherlands.